A common application in machine and plant construction is the simultaneous display of a PC screen on several monitors. 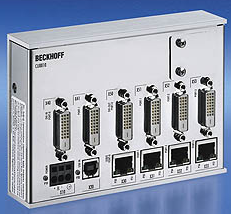 Up to four DVI/USB Control Panels can be connected to a PC via the CU8810 DVI splitter. Thanks to DVI/USB extension technology, the Control Panels can each be connected at distances of 50 m from the DVI splitter. PCs with two DVI outputs, which are configured as extended desktops, generate two different screen contents. Both DVI outputs can be fed into the DVI splitter. 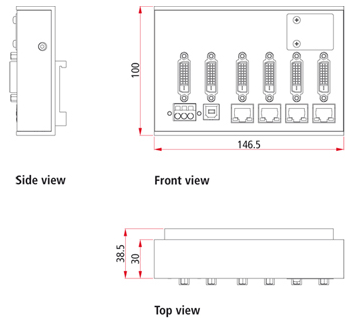 Using DIP switches, the four DVI outputs can each be assigned to one of the two DVI inputs, so that the Control Panels show either the left or the right half of the desktop, as selected.